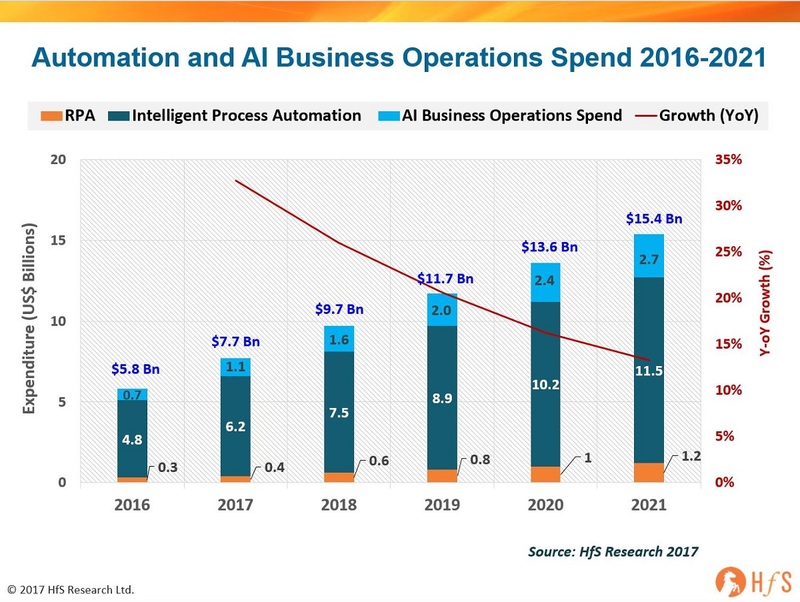 As we revealed earlier this year, despite all the ridiculous hype, the global market for RPA Software and Services will pass $400 million in 2017 and is expected to grow to $1.2 billion by 2021 at a compound annual growth rate of 36%. The direct services market includes implementation and consulting services focused on building RPA capabilities within an organization. It does not include wider operational services like BPO, which may include RPA becoming increasingly embedded in its delivery. RPA Definition: RPA describes a software development toolkit that allows non-engineers to quickly create software robots (known commonly as "bots") to automate rules-driven business processes. At the core, an RPA system imitates human interventions that interact with internal IT systems. It is a non-invasive application that requires minimum integration with the existing IT setup; delivering productivity by replacing human effort to complete the task. Any company which has labor-intensive processes, where people are performing high-volume, highly transactional process functions, will boost their capabilities and save money and time with robotic process automation. Similarly, RPA offers enough advantage to companies which operate with very few people or shortage of labor. Both situations offer a welcome opportunity to save on cost as well as streamline the resource allocation by deploying automation. RPA is only 10% of the true picture when it comes to total spending by enterprises on automating their processes. The internal training and development, pilot projects and trial implementations, is so much larger than simply software licences and third-party professional services to work the software effectively. We term this broader automation market, beyond RPA as "Intelligent Process Automation". This market will surpass $6bn this year and more than double over the next four years. External professional services: Relates to all external spending focused on developing business process automation strategies / roadmaps and the use/ implementation of automation with business functions. Internal operational spend: Includes internal and external spending on automation – change management, IT and operational teams focused on process automation and automation use as part of existing business process management initiatives. And the most talked about area is Artificial Intelligence (AI), which is already emerging as a billion dollar market for enterprise operations, and could almost treble in spend in four years. AI Definition: AI refers to the simulation of human thought processes across enterprise operations, where the system makes autonomous decisions, using high-level policies, constantly monitoring and optimizing its performance and automatically adapting itself to changing conditions and evolving business rules and dynamics. It involves self-learning systems that use data mining, pattern recognition, machine learning. virtual agents, computer vision and natural language processing to mimic the way the human brain works, without continuous manual intervention. In short, every siloed dataset restricts the analytical insight that makes process owners strategic contributors to the business. You can’t create value - or transform a business operation - without converged, real-time data. Digitally-driven organizations must create a Digital Underbelly to support the front office by automating manual processes, digitizing manual documents to create converged datasets, and embracing the cloud in a way that enables genuine scalability and security for a digital organization. Organizations simply cannot be effective with a digital strategy without automating processes intelligently - forget all the hype around robotics and jobs going away, this is about making processes run digitally so smart organizations can grow their digital businesses and create new work and opportunities. 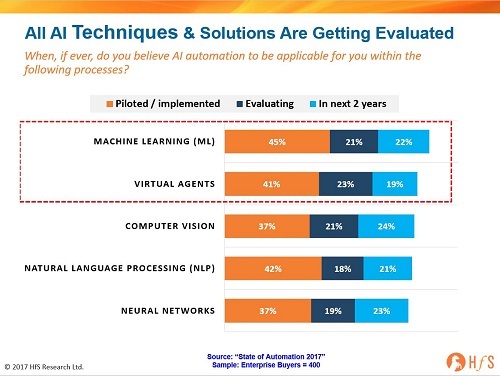 This is where RPA adds most value today... however, as more processes become digitized, the more value we can glean from cognitive applications that feed off data patterns to help orchestrate more intelligent, broader process chains that link the front to the back office. 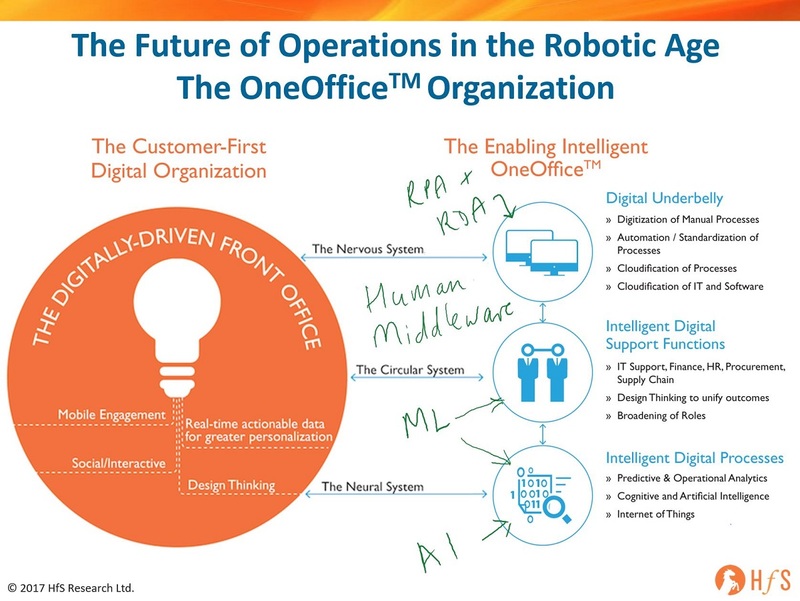 In our view, as these solutions mature, we'll see a real convergence of analytics, RPA and cognitive solutions as intelligent data orchestration becomes the true lifeblood - and currency - for organizations. It would be a sin not to grab at least a fraction of that growing pie. I wonder how a co-relating graph would look like that trends the associated /equivalent job losses in the near, if not, long term. Long live AI despite the evil prophecies of Dr Hawkings! Phil - this is great research to share. How impactful do you see machine learning in terms of investments and adoption? Without understanding what’s happened in the past, AI cannot provide an optimal customer service experience. People who buy those cars may have a basic understanding of how the technologies work, but most tend to focus on the benefits that come with an investment in the technology, notably spending less on gas while also helping to save the environment. It’s not necessarily the technology itself that’s most important, but rather the impact that the technology has on the experience of their users. IBM’s Watson utilizes the information it has available to answer questions and make decisions, based on probabilities, but it doesn’t have the capabilities to remember and apply an understanding of what may have happened in the past. Deep learning ML systems are all about storing what has been learned in the past, takes note of how variables and results have changed under different scenarios and then make decisions based on that. A chatbot that knows what the product inventory looks like, how to calculate shipping information and complete the sale — with no human needed. But, without a deeper learning, it cannot make recommendations about other products that a specific shopper might like based on previous visits.